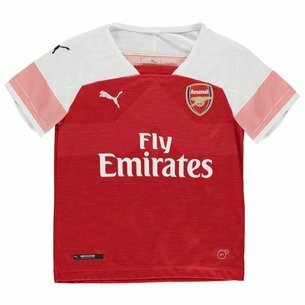 Look good on and off the pitch, matching the way Arsenal play. 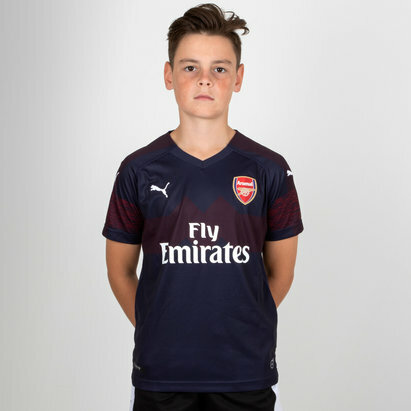 Be sure to pull on this Arsenal FC 18/19 third Kids S/S Football Shirt from Puma. This football shirt of the Premier League's invincibles Arsenal FC features a ‘W’ engineered into the shirt. The ‘W’ represents the attacking part of the famous WM formation introduced in the 1930s by Arsenal legend Herbert Chapman. It directly links to the ‘M’ graphic on the new away shirt. The dryCELL within the material will help to keep you dry during exercise by drawing moisture away from the skin and the A-symmetric style will not ride up the back when arms are raised all offering a comfortable and relaxed fit. This jersey comes ina biscay green with navy detailing reminiscent of the 1982/83 ‘Bluebottle’ kit. This shirt features a concealed one-button placket with a fold-over collar offering a smarter look when worn casually. This eye-catching design consists of navy detailing on the sleeve to the 'W' on the chest and brings two navy bands around the cuffs of the sleeves. The club crest and Puma logo are also in navy on the left and right as worn, respectively. 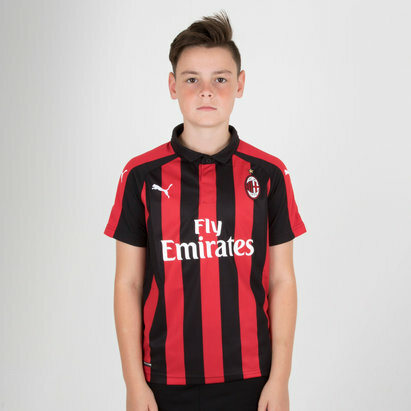 The club's sponsor - Fly Emirates - is printed across the middle of the shirt in navy. Woven Arsenal crest and Puma logo. Underarm side panels offering added ventilation. 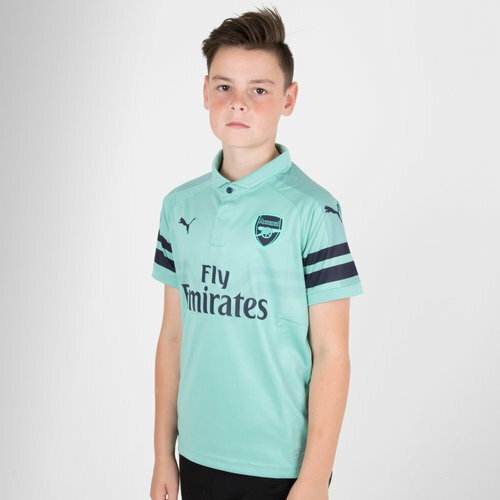 This 18/19 third shirt is the perfect item to wear casually, for a kickabout, to training or to the Emirates to cheer on your side. Have the confidence to play like Pierre-Emerick Aubameyang in this strip.